Looks delicious! You can’t go wrong with leek and asparagus in soup! I made this and it was delish. I had to proportion it down because of how much of the ingredients I had. Just wondering, did you take off the hard stalk of the asparagus (not sure what the term for that is–I’m sure there is one!!)? Because it wasn’t mentioned above I wasn’t sure, and I did it, and ended up with quite a bit less than 5 cups of asparagus. Hi Margaret! So happy you made it and liked it! Yay! Yes, I removed the hard part of the stalks – I forgot to mention that in the recipe write-up. I guess the bunch I bought was giant-sized, because even after doing that, I still had about 5 cups of chopped asparagus. But it’s so easy to scale with soups, so once you chop up the asparagus and see what you’ve got you can adjust the other amounts, like you did! Leeks and asparagus- you can’t go wrong. I bet this was delicious! I would definitely eat this at a potluck. You got my vote! It was really good! Thanks! Asparagus and leek- always a winning combination! It looks so creamy, yum! It’s very creamy and delicious! I love leeks too, and I think they’re a fantastic soup ingredient. It’s just coming into asparagus time here, this would be a great soup to try, thanks for the inspiration. This soup is right up my alley. Simple but divine. I love the addition of white beans. Great idea! I love the way the color turned out, too. Perfect way to describe it – simple yet divine! Asparagus is one of my all time favorite veggies!! This soup sounds delishhh. Delicious indeed! I love that you used beans to make it creamy and to thicken it! Yummy! Yeah, the beans worked out perfectly! Yay, I love Deborah Madison recipes! 🙂 This soup sounds divine. I love the flavor of leeks (but my fiancee will ONLY eat them pureed because she hates the texture otherwise), and pureed asparagus soup makes me nostalgic for Spain because my host mother used to make that for me. Combining those two into a soup– along with white beans– is genius! Leeks in soup are so good. Deborah Madison’s cookbooks are a staple reference around here! Asparagus! Loveeee! This looks so goood! Happy VVP! Yeah, give it a try, it is awesome! Pingback: Virtual Vegan Potluck! | Eat. Breathe. Balance. Perfect springtime dish – when you want something warm still, but also bright and fresh. Thank you for participating in the Potluck! PS can you please update your Back link to: http://www.eatbreathebalance.com/2013/05/11/virtual-vegan-potluck/ Curly Adventurer was a no-show. Thanks! Oh sure, I think that is my current Back link! A lovely soup this is & so seasonal too! A great 1st entry for the VVP! Well done! MMMMMMMMMMM! I loved doing it too! This sounds really good. Will definitely be giving it a try!! Oh, great! Let me know how it goes! 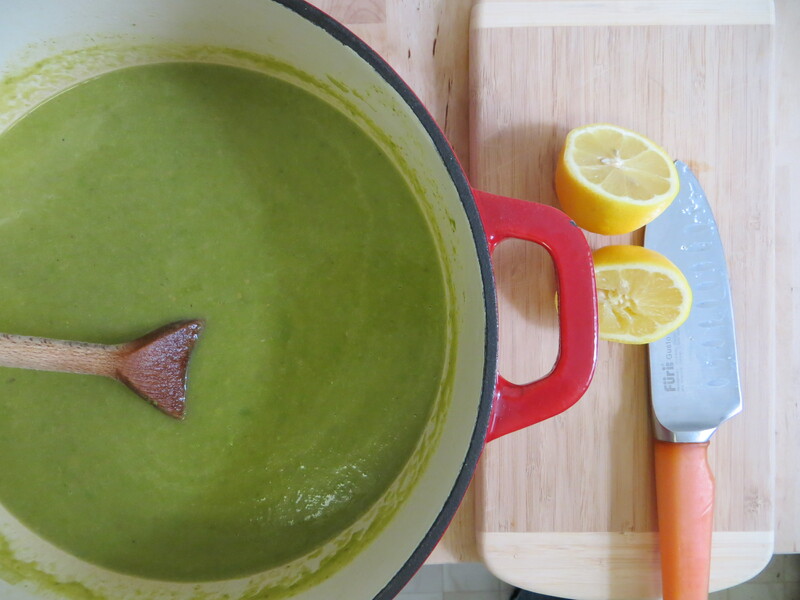 That first image of the soup with the lemons couldn’t look more spring time if it tried! I love asparagus soup and yours looks fantastic! Thanks! I had actually never made a creamy asparagus soup before this one, so I was a little nervous about how it would turn out. I’m glad I took a chance, though, because it was so good! I love that the VVP pushed me to try something new! Sounds delicious! I will have to try it sometime soon, especially since it’s asparagus season and I love asparagus. It’s the perfect soup for this time of year! Let me know if you try it! Thats a lovely pot of soup inna lovely pot! What more could you want?? Why, thank you! 🙂 It is my favorite soup pot and one of my new favorite soups!